Dr. Samer Kafelghazal, a Livonia-based physician who specializes in weight management and treatment of obesity, spoke with DBusiness Daily News about the impact of growing obesity rates and his efforts to reduce those numbers. 1. DDN: How does Michigan compare with the rest of the nation in terms of obesity? SK: Michigan ranks No. 6, with about 30-32 percent obesity. Colorado is the healthiest state. They have around a 20 percent rate of obesity. And Louisiana is the fattest state with 35 percent obesity. Obesity is an epidemic that is concentrated in the Midwest down to the South. Part of that has to do with socio economic concentrations, so states that have younger generations, with more educated people and a higher socio economic status, tend to be healthier, more active, and have better access to health care than in inner cities. But to be honest, this is turning into an international thing. Right now, the obesity rate in China is doubling every year because they are getting (wealthier). The more money they make, the more food they can afford, and they first thing they want to do is eat a western style diet (heavy in fast food). It’s the same thing in the United Kingdom. People there are gaining weight faster than in France and Italy and part of it is that their economy is bigger. Brazil is the biggest economy in South America, and they have the highest rate of obesity in all South American countries. So in poor countries, they become obese when they start making money. In rich countries, you become obese when you’re poor. 2. DDN: What problems does this introduce? SK: It’s going to be very costly. In 2008, the Centers for Disease Control said that the United States spent about $150 billion to treat obesity and the complications of obesity. The impact goes beyond illness and hospitalization. It leads to time off work. It affects the ability for a company to be productive if their employees are taking time off to deal with medical problems dealing with obesity. With the new health care law, which prevents insurance companies from punishing you for preexisting conditions, insurance companies are asking physicians to tell them a patient’s BMI (body mass index), which is the ratio between height and weight. So your BMI, which determines whether or not your obese, is determining how much the insurance company charges. 3. DDN: Tell us about your new weight management program. SK: After 20 years of working with patients, I’ve noticed that I lose a lot of patients who are hardworking because they travel for work or have to go to school activities for their children. When I look up their charts, I see there’s five missing appointments, so the patients get off track and what we’re working on is completely undone in a couple of weeks. So in the last two years, there has been a lot of academic research about how we can use technology for health care. For instance, they were talking about psychiatrists counseling their patients online, and I saw there was no reason why I couldn’t use the same methods and technology to connect with (my weight loss) patients and provide them with the same guidance, the same coaching, and the same services without them actually be in the office. That takes away the barrier. (Since launching the program six weeks ago), I’ve found that I can actually connect with my patients more online. When they have a question, they send me an email, (whereas) patients who see me in the office forget their question by the time their appointment comes. 4. DDN: What challenges does that bring? SK:We’ve been working on this since last summer, because we had to do a lot of legal background things because it’s practicing medicine online. Also, we had to create the technology to communicate with patients in a secure, HIPAA compliant environment, so it took some time to get things going. The (main) barrier we’ve had is that insurance companies in the state of Michigan will not pay for this (online program). Companies in other states, like Minnesota and California, will cover it, but we’re still behind on it in Michigan. So we’ve been trying to price our program so that it’s cheaper to do it online than it is to pay the deductibles and copays for an office visit. I can afford to do it cheaper because, since it’s not in the office, it costs me less overhead. And it allows me to provide better service, get better results, and have better retention of patients. 5. DDN: How do you hope to grow the program? SK: I plan to reach out to small companies, with maybe 100 to 200 employees, in southeast Michigan and offer their employees a special rate. It won’t cost the company any money, but it will save them money on insurance since it costs more money to insure an obese person. If we can bring their BMI under 30, they will not be obese and the rate to insure them will be significantly lower. That could saves thousands to tens of thousands of dollars per year for those small businesses. Also, I want to use hi-tech wearable devices that can interact with (a patient’s) cellphone and keeps track of their calories, heart rate, and blood pressure. Actually, the new iWatch and new iPhone will have those biometrics, so within in a year, my patients may actually be able to forward me a screenshot from their phone that will tell me about their activity and vital signs. 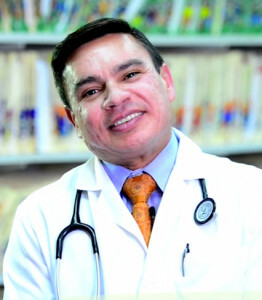 For more information about Kafelghazal’s practice, visit virtualweightmanagement.com.